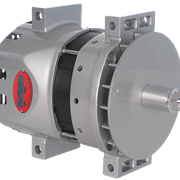 Perhaps the leader in manufacturing of heavy duty alternators, Delco Remy replacement alternators are commonly found in many types of vehicles, and for some fleets of buses, fire trucks, and other heavy duty vehicles, they have become an industry standard. In fact, in many new models of heavy duty vehicles, Delco Remy alternators are pre-installed. Similarly to other high output alternators and competitors, Remy replacement alternators are durable and long-lasting. However, while the company has expanded to include brushless models of heavy duty alternators, they still have not solved the high output, high RPM problem. An unfortunate fact about most high output alternators on the market is that they also keep the engine RPM high at idle. This takes an unnecessary toll on the engine, in addition to wearing out the battery too soon. This kind of operation is also tough on the alternator itself. However, Eco-Tech has managed to solve this problem with patented magnet technology that is also a greener solution. 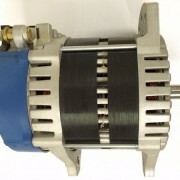 An example of a heavy duty Eco-Tech alternator is one that can generate 260 Amperes at idle, while only at 1,800 RPM. Competitors like Remy replacement alternators are barely able to lower the RPM to 2,000. The switch to Eco-Tech also eliminates the need for additional components installed on heavy duty vehicles. These such components include things such as load shedding devices, high idle devices, and multiple battery packs. An Eco-Tech alternator saves money on extra components, and wear and tear on the engine, battery, and alternator. Where owners of Eco-Tech products see the most savings, however, is in their fuel costs. The fuel penalty at high idle is eliminated with an Eco-Tech alternator, allowing 50 percent less drag on the engine. When comparing costs, the switch to Eco-Tech just makes sense – it’s cost effective while working to reduce the carbon footprint.